In 1976 it was brought to the attention of Budimir Library that there might be some interest in creating a quilting group. So a library flyer and article in the newspaper invited interested parties to attend an adult program on September 16, 1976 at Budimir Library called “On Pins and Needles”. The presenter was Maureen Laporte who showed some quilts and talked about quilting. The group seemed interested in making a quilt, so on September 23, 1976, Maureen taught “Cathedral Window” quilting. On October 4, the group returned to the library and with scrap fabrics began working on a “Dresden Plate” quilt. This was set up on a frame in the library and for every hour you quilted you received a raffle ticket. When the quilt was complete a ticket was drawn and the first quilt winner was Helen Janisse. On October 11, 1977 the group completed a “Log cabin” quilt again out of scraps. The winner was Angelina Facchinato. By now the ladies attending were enjoying the idea of quilting. So they began meeting regularly, and decide to form a guild, which came about on April 3, 1978 with 25 members: Stelle Boucher, Kenlyn Bryant, Jacqueline Burrell, Irene Chartrand, Ruth Danyluk, Angelina Facchinato, Doreen Glenn, Enise Hunter, Helen Janisse, Maureen Laporte, Edna Littlehales, Mary Longson, Agnes Mahaffy, Mary A. Manherz, Dorothy McMurdie, Anne Milani, Ruth Mizzen, Mary Anne Pierre, Adeline Quaggiotto, Kay Ridgewell, Betty Rymerson, Bev Setterington, Jean Smith, Jean Speiran, and Joan Switzer. 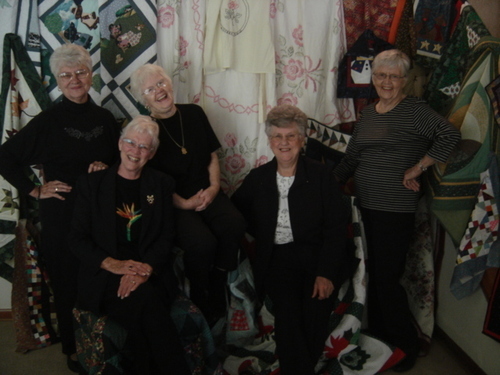 On May 15, 1979, the Windsor Quilters’ Guild held its first Quilt Show. It was a one day event at Oakwood Community Centre, from 11:00 to 4:00pm. One hundred quilts were shown. There was also a quilt raffle of a blue and white sampler. The show was free and the quilts were hung over hockey racks and tables. Who would have guessed that over 35 years later we would still be following in the footsteps of these first ladies? To those founding members who remain we “THANK YOU” and I hope we can continue to bring love, joy, pride and fellowship to the Guild that you started.